Grass in Super Smash Bros. for Wii U. This article is about the item in SSB4 and Ultimate. For the attack effect in Brawl, see Grass. Grass (グラス, "Grass") is an item in Super Smash Bros. 4 and Super Smash Bros. Ultimate. 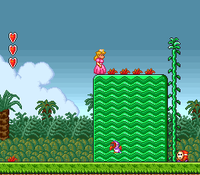 Peach next to several patches of grass in the Super Mario All-Stars version of Super Mario Bros. 2. Red (black in Yume Kōjō: Doki Doki Panic) tufts of grass appear in Super Mario Bros. 2, which when plucked produce an item, most commonly a vegetable but sometimes a Magic Potion, a POW Block, a bomb, or a Turtle Shell. In Subspace, plucking grass rewards the player with coins that can be spent at the end-of-level slot machine. Players can also pull up Stop Watches (in place of every fifth ripe vegetable), Rockets, and in the GBA remake, hearts, all of which activate immediately: this may have inspired the instant effect-granting properties of any plucked status or recovery items in Super Smash Bros. 4. Grass tufts reappear in Super Mario Advance 4: Super Mario Bros. 3, working like they did in Super Mario Bros. 2, though they are now green like the vegetables' leaves. Grass is replaced by Pluck Patches in Captain Toad: Treasure Tracker, which work the same way. Greninja having just obtained a Fire Bar from grass. It manifests as a tuft of grass which randomly appears on the ground. The character who plucks the grass receives a random item - with some exceptions such as Freezies and Pitfalls - and briefly holds it above their head before wielding it (if it can be wielded) or automatically using it (if it is a status or recovery item). Similar to Crates and Barrels, grass cannot be plucked in mid-air. Grass vanishes if the platform it is on disappears. A patch of overgrown grass with an item buried underneath. Grass like this grew all over the place in Super Mario Bros. 2, and Mario and co. could pull it up to get all kinds of handy items for their quest. It works the same way in this game: pull it up to get an item. Who knows what it'll be? Grass reappears as an item in Ultimate with the same properties as Smash 4. However, it does not appear in the list of items when editing Rules. This page was last edited on March 26, 2019, at 04:01.